When I think of grace, I think of the old, brown couch that incriminates me. That couch, though made soft by years and years of sitting and lying, condemns me with the hardest of stares. I feel it every time I see or sit on the couch, feel its short, soft fabric catch underneath my fingernails. I feel regret on my fingers and catch my breath. When I think of grace, I think of the old, brown couch and the boys who lay there once. I feel the weight of bodies and shame, the burn. When I think of grace, I think of the old, brown couch and what it took from me. Or, rather, I think of what I gave it. I feel its softness on the small of my back, on my cheek. When I think of grace, I think of bloodshed, the payment for my sin. I must offer a sacrifice, something pure, something without blemish. Something beyond my means to give. I approach the seat of judgment, not ready for punishment, and certainly not ready for what comes next. When I think of grace, I think of bloodshed—what should have been my own. I think of the wrath of God poured out on a picture of innocence, a lamb, a perfect man. A perfect God. The thought is overwhelming, heartbreaking. The wrath of God—on Him? Jesus didn’t deserve it. I did. I do. When I think of grace, I think of bloodshed, of life spilled out for our sakes. He hangs there, bruised and bleeding, dead. Red drops from His hands, feet, and side. We had nothing to offer, so He offered it all. And it was all for me and for you. When I think of grace, I think of my husband, of the purity he brought into my life. His lips, touched only by food and Carmex and my own, speak Truth. I run my fingers through his hair, push it up high like Jimmy Neutron’s when it’s long enough. He is the softness I seek, my beloved. He is God’s love. When I think of grace, I think of my husband when I tell him what I’ve done. I think of the tears and the hurt, the betrayal I didn’t know I was making. He cries with me. One of his tears joins one of mine on my arm, forming one drop. He forgives me, sees me as blameless, and holds my shaking body. He loves me, he says, regardless of my past. 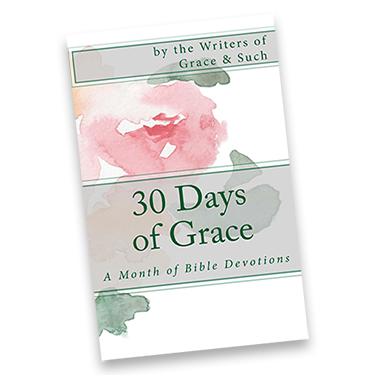 When I think of grace, I think of my husband on our wedding day, his face red and damp upon my arrival at the end of the aisle. His vows, blue ink on white paper, promise I will always come second, while God will always come first. This promise, more than anything, assures me of the love he has for me, the love I don’t deserve. He is the embodiment of grace, my daily and tangible reminder. When I think of grace, I think of eternity at Jesus’ feet, an eternity so perfect that nothing else matters. With Jesus, nothing else matters but Him. He is the joy of my life, the comforter of my soul, the greatest love I’ll ever know. Grace replaces shame on that old, brown couch, and my husband is my worldly reminder of that Truth. When I think of grace, I think of an eternity I don’t deserve—perfected in death and as blameless as the lamb who was slain. There is such a sweet beauty to this, Natalie. Thank you for sharing this with us. Simply elegant. Thank you for the look at grace through your eyes, Natalie. A special look into your heart of grace. Thank you, Natalie.